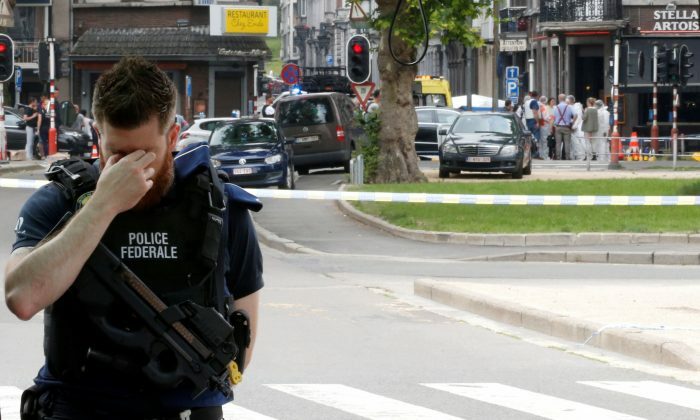 LIEGE, Belgium — Belgian authorities sought to deflect questions on Wednesday, May 30, over the furlough of a convicted criminal, known to have been radicalized in jail, who killed three people in the Belgian city of Liege. Just hours after his release, the man named by Belgian media as Benjamin Herman killed two policewomen and a bystander on Tuesday, May 29, before being gunned down in what officials say was a terrorist attack. Police also suspect the 36-year-old of the murder of a former associate found dead at his home. The two female officers have been identified as 45-year-old Lucile Garcia and 53-year-old Soraya Belkacemi, reported news.com.au. Belkacemi was the mother of 13-year-old twin daughters who earlier lost their father, also a police officer. A 22-year-old man, Cyril Vangriecken, was shot dead as he sat in a parked car. Four other officers were reportedly wounded during the attack. In and out of jail for a variety of crimes since 2003, Herman found a path to violence that has heightened concerns Europe’s prisons are incubators for radicalism. He converted to Islam while in detention, a Belgian security source told Reuters, and was under suspicion of radicalization. In Belgium, a prisoner’s inclusion on a state security list as a suspected radical is not automatically communicated to all police or the prison service, experts say. It was the fourteenth time since his detention that he was granted temporary leave, intended to help him prepare for eventual reintegration into society in 2020, Justice Minister Koen Geens told reporters. “Everyone in Belgium is asking the same question: how is it possible that someone convicted for such serious acts was allowed to leave prisons?” Belgium’s deputy prime minister Alexander de Croo was cited by local media as saying. Herman stabbed the policewomen from behind at around 10:30 a.m. on a boulevard in the centre of Belgium’s third biggest city, seized their handguns and shot both. He shot dead a 22-year-old trainee teacher who was sitting in a car before entering a high school about 100 yards (100 meters) away and taking two female employees hostage. That triggered a major intervention by armed police. Pupils were moved to safety as a gun battle broke out that sent people in the street racing for cover. The gunman was heard shouting “Allahu Akbar” — God is greatest in Arabic — when he burst from the school shooting at police, in a video shot by local residents. Four police officers were wounded before the attacker was finally killed. The national crisis centre, on high alert since past attacks by Islamic State in Paris and Brussels in the past three years, said it was monitoring events but had not raised its alert level, an indication follow-up attacks were not expected. The attacker’s profile drew concern about the risk of petty criminals, including those not from Muslim backgrounds, being inspired to Islamist violence while jailed. Convicts have been behind several recent attacks in Europe. Hundreds of prisoners deemed radical by authorities are due to be released in the coming years, the Belgian parliament warned in a report late last year. “They come in as drug dealers and leave as Salafi jihadists,” a security source said. Justice Minister Koen Geens defended the decision to grant the attacker prison leave, saying there was no reason to suspect this time would be a different from his earlier furloughs. Prime Minister Charles Michel also said that Herman had not figured directly on the main national register of threats. But with Belgian media reporting that he was flagged as radical as recently as last year, the furlough raised concerns. “If it were me, I would not have let him go,” said Brussels security consultant Claude Moniquet, a former French agent. Security services in Belgium and France have faced criticism at home and abroad for intelligence failures and their response to attacks in Brussels, Paris and Nice. A Brussels-based Islamic State cell was involved in attacks on Paris in 2015 that killed 130 people and on Brussels in 2016 in which 32 died.